Information about the time and venue for the interviews and training will be sent to shortlisted applicants individually. Thank you for applying. The deadline for applying to the summer teaching programme is 31 May. Please make sure your application is submitted on time. We look forward to receiving your forms. 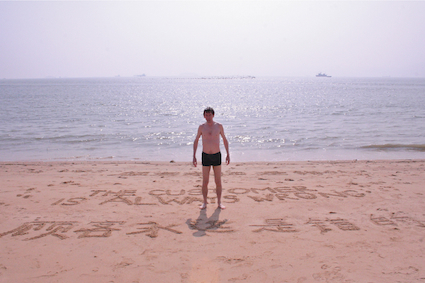 Students from the Inspiring Chinese Course went to see The Customer Is Always Wrong on 14 May in Permanent Gallery, Brighton. This show was created by artist Bill Aitchiso after his visit to Southern China for the last three months. The Customer Is Always Wrong uses the state of being a visitor to China to creatively plot the intricacies of national and cultural identities and take a sideways look at the hypocrisies of commercial culture. The show is in Chinese and imperfect English translation. It’s unique, different and humorous. We enjoyed the performance, although it wasn’t what we expected. We also had an interesting discussion with the artist and the other audience afterwards. Jay and Kenya even learnt a few new Chinese words by watching the show! The Customer Is Always Wrong is part of the House Festival of Brighton Festival.